Getting scientific equipment to the Earth's moon or other planets safely and in workable condition is a challenge for NASA scientists and engineers. 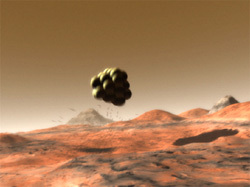 Airbags in missions to Mars and in future missions to the moon are used to cushion the landing of equipment on terrain that is rough and rocky. Sensitive scientific gear is essentially crash landed on the surface using inflatable airbag technology. You are part of a team of NASA engineers who have been asked to design and create a prototype of an airbag landing system for future moon voyages. 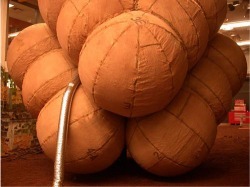 You can learn more about airbag construction and inflatable structures using the links in the "Resources" section below. 1. Students will be divided into engineering design teams of two to three students who will work together to brainstorm ideas, consolidate and organize their ideas, and then choose materials and create a prototype of an lunar airbag system. 2. Teams will test their prototypes by placing a raw egg inside and dropping from the second floor mezzanine of SHS onto the first floor below. A successful design will land the egg intact. 3. Use a digital camera to create a documentary of the process, final product, and results. Results must be reported in terms of impulse and momentum change experienced by the egg. 4. Based on the test results, what changes/modifications could be made to improve the airbag design? 5. Assess your work using the assessment rubric provided below in the "Resources" section. 6. Final products will be uploaded to this website. Thank you to the Christa McAuliffe Center for their resources and contributions to this website. (Also, my Master of Arts in Teaching Secondary Physics from the College of Notre Dame was funded by the Sharon Christa McAuliffe scholarship).